Some toothpaste contains peroxide, and because of this you’ll want to remove toothpaste from carpet as quickly as possible. Peroxide can lighten carpet fibers and cause permanent discoloration. To remove toothpaste from carpet, use water and a clean towel. Pinch and lift the carpet fiber in an upward motion. To remove toothpaste from carpet, you will need clean white cloth or paper towels. You’ll also want to have a spoon and small bowl of water available. 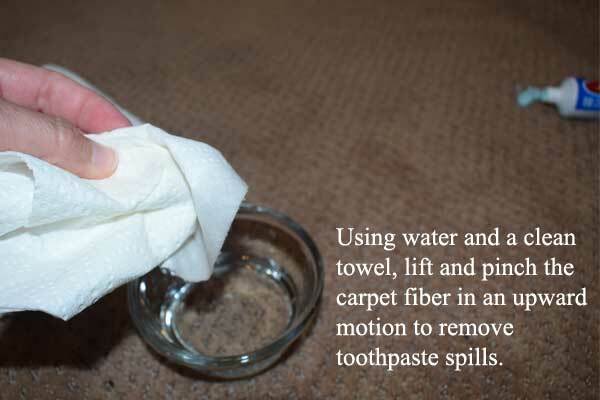 Begin by using a paper towel and pinch/lift motion to pull the toothpaste up and out of the carpet. This trick will keep the toothpaste spill contained to the smallest area possible. Do not rub the toothpaste spill. Rubbing the affected area will spread the toothpaste through the carpet fibers. Pinching the fibers and lifting in an upward motion will give you the best results when you are trying to remove toothpaste from carpet. You can also use a spoon to scoop up larger toothpaste spills. 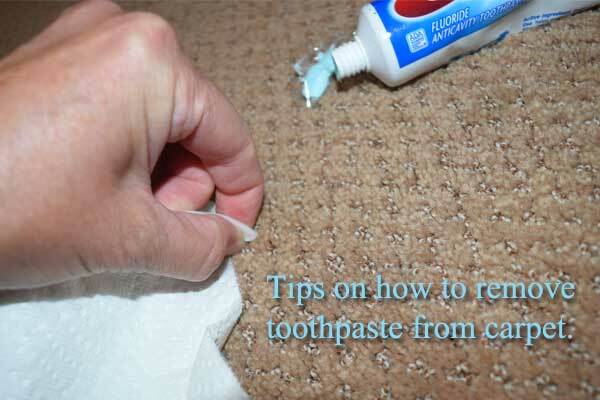 Tips to remove toothpaste from carpet. It’s important to avoid carpet spotters when possible. They can leave a soapy residue in your carpet fiber. The sticky residue will eventually attract soil, leaving you with a unsightly spot. Most toothpaste tends to dissolve in water. You should not need to use a cleaning solution to remove toothpaste from carpet. Once the majority of the toothpaste has been removed by pinching and lifting in an upward motion, you’re ready to blot. To blot, get the small bowl of cool water and a clean cotton towel. Dip the towel in the water, squeeze out excess water and gently blot the toothpaste spill. If you’re dealing with a large spot, work on the outside edges and move toward the center of the spill to avoid spreading the stain. You can also use the pinch/lift method with a damp, clean towel to remove thicker toothpaste spills. Continue to work the stain by either blotting or pinching/lifting until the toothpaste has been removed from the carpet. Remember to use a clean and dry part of the cloth each time you blot. Once you’ve removed the toothpaste from your carpet, let the area dry completely and then vacuum. Vacuuming will assist in removing dried toothpaste residue. It will also lift the carpet fibers. Acting quickly is probably the most important thing when you remove toothpaste from carpet. There are many, many toothpaste varieties and they will all react with your carpet differently. The more quickly you can remove the toothpaste, the less chance of permanent discoloration. You should always consult your professional carpet cleaner for additional advice.